A new content update has come through for NBA Live 19. As with all content updates, it will be downloaded automatically upon firing up the game, provided that your console has an active Internet connection. Key features of the January 25th content update include the latest rosters, and new items in The One Store. In addition to the latest transactions and lineups, the new rosters contain several ratings updates. Some of the biggest movers and shakers include LeBron James, Russell Westbrook, James Harden, Joel Embiid, D’Angelo Russell, and Luka Doncic. New items in The One Store include Black History Month shoes, Nike Team logo t-shirts, Icon and Association shorts, and new court items. For a full breakdown of the changes to the rosters, please check out the above link. 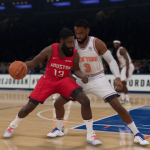 For a history of NBA Live 19 title updates, see this article over in our Wiki. Also, don’t forget that we want to get our NBA Live 20 Wishlist submitted by the end of the January, so be sure to post your feedback in this Forum topic.